If you like older caravans, hopefully this will be of interest - a free screensaver, featuring a variety of classic and vintage tourers. Don't forget, when you're finished here, you can read lots more about old caravans in this section at oldclassiccar! There are loads of old-car screensavers on oldclassiccar, but up until now there was none featuring classic & preserved caravans, of the type that can be seen towed by older cars at shows etc. This screensaver contains 10 pictures of classic caravans seen at various events in Britain. Included are some real rarities, including the 50s Portafold folding caravan, a Wessex, and a lovely 2-tone Winchester dating to the 1930s. 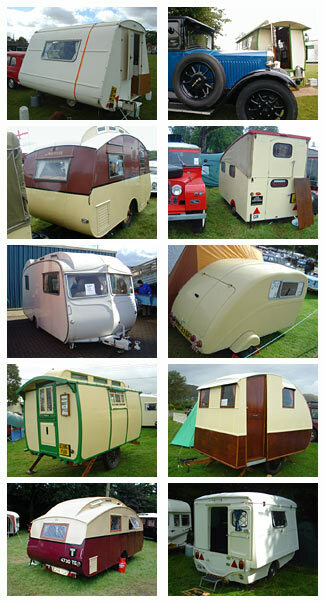 The top left caravan, a French type seen at Malvern, is based on Renault 4 mechanicals!